Exposure Data: 13.09.2003. L=10x10min. (2x2), compl. 1 hour and 40 minutes. Optical System: 348/3007mm Hypergraph-Cassegrain, Starlight Xpress SXV-H9, Astronomik Filter wheel FR-03, Type II.b-L-Filter, Astro-Physics 1200 ESCAP-FS-2-GoTo. Off-axis guided with Starlight Xpress SXV-Autoguider camera. Comments: Taken during full moon. Average FWHM was 2,4 arc-seconds. Medium seeing and bad fst around 3,5mag only. Picture upsampled 15% for a better view. The diameter of this 13 mag. Sc-Galaxy is only 1,4x1,6 arc minutes. The faint star at three o'clock, 30mm away, is 20mag. Exposure Data: 23.03.2003. LRGB: L=20x10min. (2x2), R=4x10min. (3x3), G=4x10min. (3x3), B=6x10min. (3x3), compl. 5 2/3 hours. Processing: Acquired via MSB AstroArt, no darks+flats, Median combined (1,1:1:2,0) in MaxIm DL, RL-deconvolved in AIP4Win, registered in RegiStar, LRGB combined and many other processing steps in Photoshop. Optical System: 348/3007mm Hypergraph-Cassegrain, Starlight Xpress SXV-H9, AstroMechanik Filter wheel AM4 and Idas LRGB-Filterset Type 2, Astro-Physics 1200 QMD with Koch FS-2-GoTo. Off-axis guided with Starlight Xpress MX 516 without AO7. Comments: Average FWHM was 2,2 arc-seconds, Medium transparency. 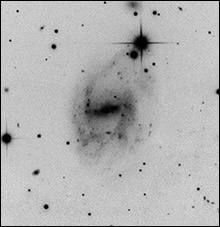 The field is 10x7,5 arc-minutes around the bright (13mag) NGC 3842. Picture upsampled 15%. North on right side. Exposure Data: 25.02.2003. LRGB: L=16x5min. (2x2), R=5x5min. (3x3), G=5x5min. (3x3), B=5x8min. (3x3), compl. 2 3/4 hours. Processing: Acquired via MSB AstroArt, no darks+flats, Median combined (1:1,1:1,2) in MaxIm DL, RL-deconvolved in AIP4Win, registered in RegiStar, LRGB combined and many other processing steps in Photoshop. Comments: Average FWHM was 2,9 arc-seconds, Medium transparency, extreme lousy seeing conditions. My first try in DDP. Exposure Data: 15.02.2003. LRGB: L=3x5min. (2x2), R=2x5min. (4x4), G=2x5min. (4x4), B=2x5min. (4x4), compl. 3/4 hour. Processing: Acquired via Starlight Xpress-Software, no darks+flats, Median combined (1:1,1:1,3) in MaxIm DL, RL-deconvolved in AIP4Win, registered in RegiStar, LRGB combined and many other processing steps in Photoshop and Neat Image. Comments: CCD-Camera first light picture taken during full moon. Average FWHM was 2,5 arc-seconds, Very noisy color channels, they need more exposure time under darker sky. Exposure Data: 16.09.2003. LRGB: L=13x20min. (1x1), R=2x20min (2x2), G=2x20min. (2x2), B=2x20min (2x2), compl. 6 1/3 hours. Processing: Acquired via MSB AstroArt, darks+flats, Median combined (1:1:1) in MaxIm DL, RL-deconvolved in AIP4Win, registered in RegiStar, LRGB combined and many other processing steps in Photoshop. Optical System: 348/3007mm Hypergraph-Cassegrain, Starlight Xpress MX 916, AstroMechanik Filter wheel AM4 and Idas LRGB-Filterset Type 2, Astro-Physics 1200 QMD with Koch FS-2-GoTo. Off-axis guided with Starlight Xpress MX 516 without AO7. Comments: Considerably faint galaxy. Average FWHM was 1,85 arc-seconds, highest resolution with my MX916-CCD-camera. Medium transparency.